For the medieval duchy of Tuscany, see March of Tuscany. The Grand Duchy of Tuscany (Italian: Granducato di Toscana, Latin: Magnus Ducatus Etruriae) was a central Italian monarchy that existed, with interruptions, from 1569 to 1859, replacing the Duchy of Florence. The grand duchy's capital was Florence. 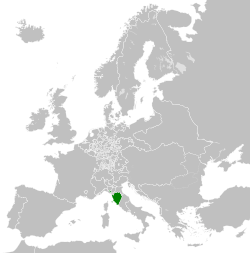 Tuscany was nominally a state of the Holy Roman Empire until the Treaty of Campo Formio in 1797. Francis Stephen of Lorraine, a cognatic descendant of the Medici, succeeded the family and ascended the throne of his Medicean ancestors. Tuscany was governed by a viceroy, Marc de Beauvau-Craon, for his entire rule. His descendants ruled, and resided in, the grand duchy until 1859, barring one interruption, when Napoleon Bonaparte gave Tuscany to the House of Bourbon-Parma. Following the collapse of the Napoleonic system in 1814, the grand duchy was restored. 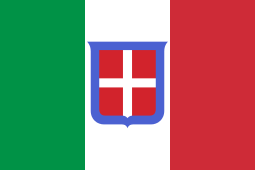 The United Provinces of Central Italy, a client state of the Kingdom of Sardinia-Piedmont, annexed Tuscany in 1859. 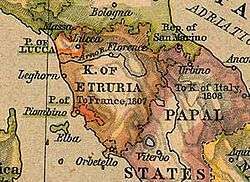 Tuscany was formally annexed to Sardinia in 1860, following a landslide referendum, in which 95% of voters approved. The international reaction to Cosimo's elevation was bleak. Queen Catherine of France, though herself a Medici, viewed Cosimo with the utmost disdain. Rumours circulated at the Viennese court that had Cosimo as a candidate for King of England. Maximilian II, Holy Roman Emperor and King Philip II of Spain reacting quite angrily, as Florence was an Imperial fief and declared Pius V's actions invalid. However, Maximilian eventually confirmed the elevation with an Imperial diploma in 1576. Ferdinando eagerly assumed the government of Tuscany. He commanded the draining of the Tuscan marshlands, built a road network in Southern Tuscany, and cultivated trade in Livorno. To augment the Tuscan silk industry, he oversaw the planting of Mulberry trees along the major roads (silk worms feed on Mulberry leaves). He shifted Tuscany away from Habsburg hegemony by marrying the first non-Habsburg candidate since Alessandro de' Medici, Duke of Florence, Christina of Lorraine, a granddaughter of Catherine de' Medici. The Spanish reaction was to construct a citadel on their portion of the island of Elba. To strengthen the new Tuscan alliance, he married the deceased Francesco's younger daughter, Marie, to Henry IV of France. Henry explicitly stated that he would defend Tuscany from Spanish aggression, but later reneged. Ferdinando was forced to marry his heir, Cosimo, to Archduchess Maria Maddalena of Austria to assuage Spain (where Maria Maddalena's sister was the incumbent Queen consort). Ferdinando sponsored a Tuscan colony in America, with the intention of establishing a Tuscan settlement in the area of what is now French Guyana. Despite all of these incentives to economic growth and prosperity, the population of Florence, at dawn of the 17th century, was a mere 75,000 souls, far smaller than the other capitals of Italy: Rome, Milan, Venice, Palermo and Naples. Francesco and Ferdinando, due to lax distinction between Medici and Tuscan state property, are thought to be wealthier than their ancestor, Cosimo de' Medici, the founder of the dynasty. The Grand Duke alone had the prerogative to exploit the state's mineral and salt resources. The fortunes of the Medici were directly tied to the Tuscan economy. Ferdindando, despite no longer being a cardinal, exercised much influence at successive Papal conclaves; elections which chose the Pope, the head of the Catholic Church. In 1605, Ferdinando succeeded in getting his candidate, Alessandro de' Medici, elected as Pope Leo XI. Leo XI died less than a month later, but fortunately for the Medici his successor Pope Paul V was also pro-Medici. Ferdinando's pro-Papal foreign policy, however, had drawbacks. Tuscany was overcome with religious orders, all of whom were not obliged to pay taxes. Ferdinando died in 1609, leaving an affluent realm; however, his inaction in international affairs drew Tuscany into the provincial yolk of politics. Leopold developed and supported many social and economic reforms. He revamped the taxation and tariff system. Smallpox vaccination was made systematically available (Leopold's mother Maria Theresa had been a huge supporter on inoculation against smallpox), and an early institution for the rehabilitation of juvenile delinquents was founded. Leopold also abolished capital punishment. On 30 November 1786, after having de facto blocked capital executions (the last was in 1769), Leopold promulgated the reform of the penal code that abolished the death penalty and ordered the destruction of all the instruments for capital execution in his land. Torture was also banned. In 2000 Tuscany's regional authorities instituted an annual holiday on 30 November to commemorate the event. The event is also commemorated on this day by 300 cities around the world celebrating the Cities for Life Day. Leopold also introduced radical reforms to the system of neglect and inhumane treatment of those deemed mentally ill. On 23 January 1774, the "legge sui pazzi" (law on the insane) was established, the first of its kind to be introduced in all Europe, allowing steps to be taken to hospitalize individuals deemed insane. A few years later Leopold undertook the project of building a new hospital, the Bonifacio. He used his skill at choosing collaborators to put a young physician, Vincenzo Chiarugi, at its head. Chiarugi and his collaborators introduced new humanitarian regulations in the running of the hospital and caring for the mentally ill patients, including banning the use of chains and physical punishment, and in so doing have been recognized as early pioneers of what later came to be known as the moral treatment movement. The Second Austro-Sardinian war broke out in the summer of 1859. Leopold felt obliged to espouse Austria's cause. Victor Emmanuel II of Sardinia captured Tuscany in its entirety, and held it for the duration of the conflict; Leopold fled Tuscany as a result. The Peace of Villafranca allowed Leopold to return once more. Upon arrival, he abdicated in favour of his elder son, Ferdinand. Ferdinand IV's hypothetical reign didn’t last long; the House of Habsburg-Lorraine was formally deposed by the National Assembly on 16 August 1859. 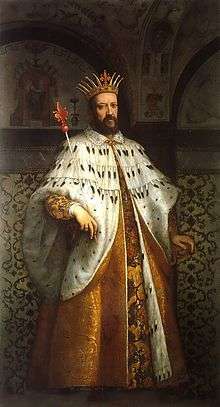 Following the Republic's surrender in the Siege of Florence, Charles V, Holy Roman Emperor issued a proclamation explicitly stating that he and he alone could determine the government of Florence. On 12 August 1530, the Emperor created the Medici hereditary rulers (capo) of the Republic of Florence. Pope Clement VII willed his relative Alessandro de' Medici to be the monarchical ruler of Florence, and went about requisitioning that dignity carefully; he wanted to give the impression that the Florentines democratically chose Alessandro to be their monarch. In April 1532, the Pope convinced the Balía, Florence's ruling commission, to draw up a new constitution. The document in question was officiated on the 27th of that month. 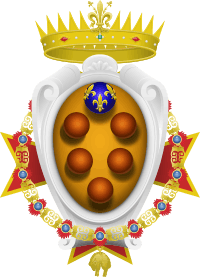 It formally created a hereditary monarchy, abolished the age-old signoria (elective government) and the office of gonfaloniere (titular ruler of Florence elected for a two month-term); in their place was the consigliere, a four-man council elected for a three-month term, headed by the "Duke of the Florentine Republic" (and later the Grand Duke of Tuscany). The Senate, composed of forty-eight men, chosen by the constitutional reform commission, was vested with the prerogative of determining Florence's financial, security, and foreign policies. Additionally, the senate appointed the commissions of war and public security, and the governors of Pisa, Arezzo, Prato, Voltera and Cortona and ambassadors. To be eligible, one had to be male and a noble. The Council of Two Hundred was a petitions court; membership was for life. This constitution was still in effect through the Medicean grand duchy, albeit the institutions decayed and powerless by the rule of Ferdinando II. Over time, the Medici acquired several territories, which included: the County of Pitigliano, purchased off the Orsini family in 1604; the County of Santa Fiora, acquired from the House of Sforza in 1633; Spain ceded Pontremoli in 1650, Silvia Piccolomini sold her estates, the Marquisate of Castiglione at the time of Cosimo I, Lordship of Pietra Santa, and the Duchy of Capistrano and the city of Penna in the Kingdom of Naples. Vittoria della Rovere brought the Duchies of Montefeltro and Rovere into the family in 1631, upon her death in 1694, they passed to her younger son, Francesco Maria de' Medici. They reverted to the crown with the ascension of Gian Gastone. Gian Gastone, the last Medici, resigned the grand duchy to Francis Stephen of Lorraine. Under him, Tuscany was ruled by a viceroy, Marc de Beauvau-Craon, Prince de Craon. 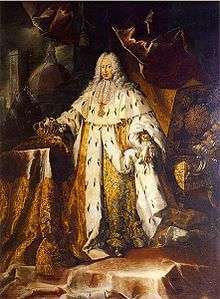 Francis Stepehen altered the laws of succession in 1763, when he declared his second son, Leopold, heir to the grand duchy. If Leopold's line were to become extinct, it would revert to the main line. Every grand duke after Leopold resided in Florence. The grand duke Leopold II agreed to ratify a liberal constitution in 1848. The grand duke was briefly deposed by a provisional government in 1849. He was restored the same year by Austrian troops. The government was totally dissolved upon its annexation to the United Provinces of Central Italy in 1859. 1 2 3 4 5 6 7 8 François Velde (July 4, 2005). "The Grand-Duchy of Tuscany". heraldica.org. Retrieved 2009-08-19. ↑ Strathern, p 375, 381. ↑ Strathern, p. 375–37, 380–381. 1 2 3 "Leopold II (holy Roman emperor) -- Encyclopædia Britannica". Britannica.com. Retrieved 2009-10-11. ↑ Mora, G. (1959) Vincenzo Chiarugi (1759–1820) and his psychiatric reform in Florence in the late 18th century (on the occasion of the bi-centenary of his birth) J Hist Med. ↑ H. A. L. Fisher, "The French Dependencies and Switzerland", in A. Ward et al. (eds. ), Cambridge Modern History, IX: Napoleon (Cambridge, 1934), p. 399. 1 2 3 4 Catholic Encyclopaedia. "Tuscany". newadvent.org. Retrieved 18 October 2009. ↑ "Leopold II (grand duke of Tuscany) -- Encyclopædia Britannica". Britannica.com. Retrieved 26 September 2009. 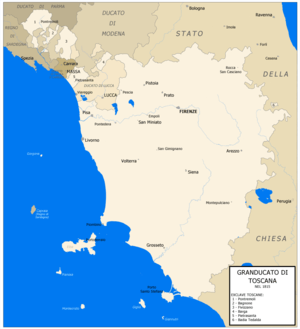 Wikimedia Commons has media related to Grand Duchy of Tuscany.